I got this recipe from my mom. It was an old staple in our house. 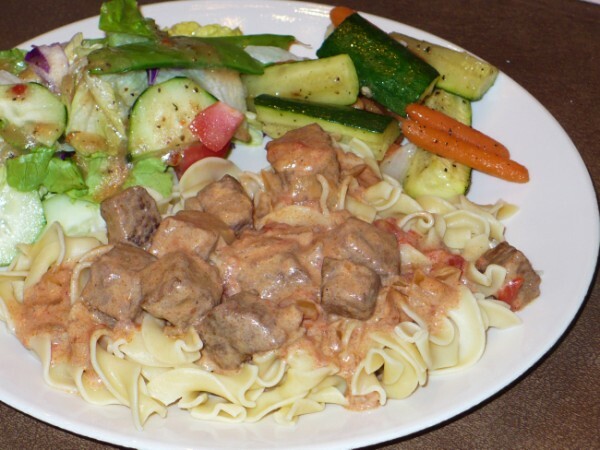 It is similar to stroganoff, but with a tomato base. It can be served over egg noodles or white rice. Combine beef, onion, and garlic in slow cooker. Sprinkle with flour and stir to coat. Add salt, pepper, paprika, thyme, bay leaf, and tomatoes and stir well. Cover and cook on low for 7-10 hours. Remove bay leaf and stir in sour cream 30 minutes before serving. Cook egg noodles according to package directions. Drain. Serve goulash over noodles.